A massive iceberg which has traveled many miles from its origin in Greenland, has finally made it near St. Lewis Inlet in Southern Labrador where it has grounded itself along the coastal shores of Great Caribou Island. The ice from this iceberg is somewhere between 10,000 to 15,000 years old which broke free from the Greenland glaciers, a process called calving, creating the start of a 2-3 year journey for this iceberg. Massive pieces of ice calving from this iceberg can create a thunderous noise as they drop into the cold waters around Great Caribou Island. Everyday as the iceberg calves and melts, the shape of its beauty changes, making it smaller everyday. 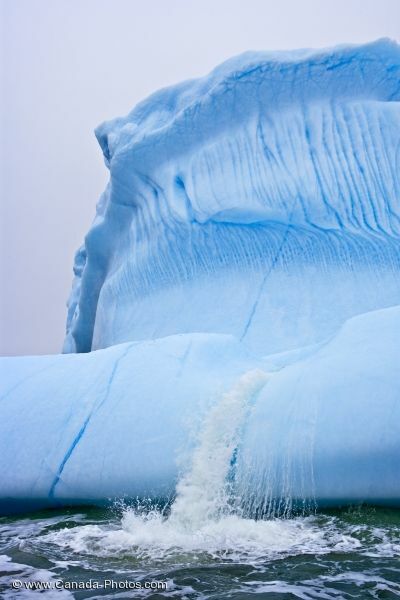 Different currents and tides may retain this iceberg around the area or eventually set it free where it will continue its journey around these waters until finally melting completely. Iceberg watching off Southern Labrador is best around May and June, with some making it through July and August. Picture of an iceberg calving along the shores of Great Caribou Island in Southern Labrador.